Marketing-Jive, formerly SEO-Space, was established in 2006 and since then we have noticed significant increases in both traffic and feed subscribers. If you want to promote your business to thousands of visitors who understand digital marketing, you’ve come to the right place. Sign up and start receiving qualified leads right now. Your ad will be visible on every unique page on our blog. 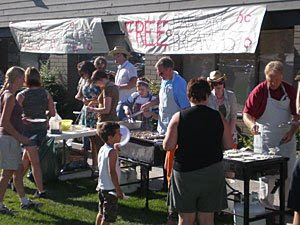 Just a reminder for those of you in the Kelowna area, that tomorrow is the annual Enquiro Stampede Pancake Breakfast. Enquiro will be conducting our 7th Annual Stampede Pancake Breakfast. As always, everyone is welcome to attend the breakfast; it will take place from 7:30 a.m. – 10:30 a.m. at the corner of Dickson Avenue and Dayton Street in Kelowna, located directly across from the Landmark III Technology building. I'll be there as will most of the other Enquiro folks including Gord "Silver-Spurred" Hotchkiss and Bill "Chuck-Wagon" Barnes. All proceeds will be going to the Kelowna's Women's Shelter. The Kelowna Women’s Shelter provides a safe haven where women and children receive emergency accommodation, childcare, support groups and counselling, both in the shelter facility and community. About Me: SEO guy by day, family man 24/7. How Much Would You Pay for an Experienced SEO?